Henry Cejudo didn’t take long to respond to T.J. Dillashaw’s adverse drug test findings. 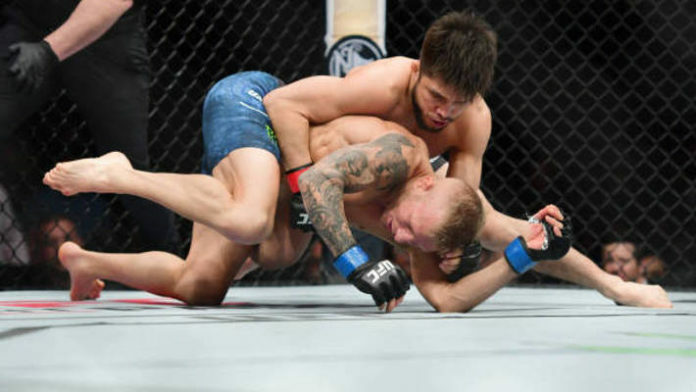 This morning (March 20), it was revealed that Dillashaw tested positive following his Ultimate Fighting Championship (UFC) flyweight title bout against Cejudo back in January. Dillashaw posted a statement claiming he voluntarily relinquished his UFC bantamweight title as he was handed a one-year suspension retroactive to Jan. 19th. “I feel bad for him. Obviously, you have your exceptions out there. Some people have have been wrongly accused in the past. But people like Lance Armstrong or Marion Jones, and I’ve looked up to her in the past, they have to live with the regret and the dishonesty for the rest of their lives. I honestly feel bad for them. Dillashaw was hoping to get a rematch with Cejudo in the flyweight division. Meanwhile, Cejudo wanted to fight Dillashaw at 135 pounds. Time will tell what transpires now that Dillashaw is no longer the UFC bantamweight champion.